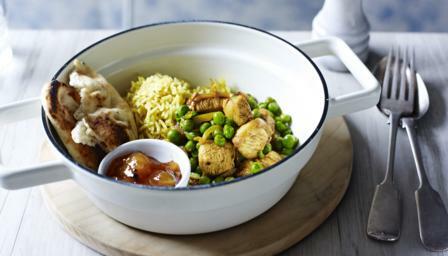 This tasty chicken curry is perfect for solo cooking on a budget. It's also ready in no time, faster than a trip to the takeaway! Heat the oil in a pan and fry the onion for a few minutes, to soften. Add the chicken and fry until the chicken is browned all over. Add the curry powder, chilli powder and turmeric and stir to coat the chicken in the spices. Stir in the peas and 70ml/2½fl oz water. Reduce the heat and simmer gently for 10-12 minutes, or until the chicken is cooked through. Remove from the heat and serve with boiled basmati rice, naan bread and any pickles or chutneys you have to hand.